Oh did you wonder what happened to me? I've been surfing template websites and wondering if it's time to switch things around here a bit. I'm also working on writing and acquiring articles for the new blog and that leaves slightly less time than I used to have for this one. Catching Monster in all her mischief is an ongoing project however, and that is why this photo blog will never truly be abandoned. As per one of my resolutions, I've started to pray more regularly. That has resulting in Monster wanting to join me in my efforts and as soon as I pick out a scarf and a ja-e namaaz, she runs to get her own mini ja-e namaaz and a random scarf whatever happens to be laying around (which in my home, amounts to at least 3-4 laying around randomly). She even attempted to drape it around her head today, so I decided to give her a hand. 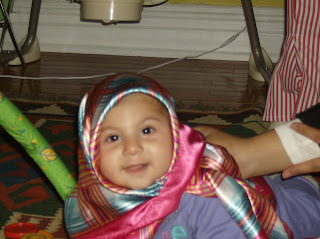 Of course, this isn't the first time I've dressed her up as a Muslima Baby.